In 2000 it wasn’t possible to mount a TV over the fireplace. However, over the past decade, modern design trends and technological advancements have resulted in a TV over the fireplace becoming the rule instead of an exception. There are of course pros and cons to it, just like there are with any other design trend. When you are discussing technology and heat, then there are definitely some drawbacks. However, every story has two sides to it. After reading the following pros and cons associated with mounting a TV above a fireplace, you can decide for yourself whether this hot design trend is one you want to use in your home. Fortunately the days of bulky, nearly impossible to move televisions are gone. They not only took up a lot of valuable space on your dresser or stand, but often were a real eyesore that detracted from the room’s decor. The introduction of flat screen TVs into the market has allowed homeowners to free up space in their homes through mounting their TVs on a wall. Although many people don’t need help from a professional to do that, others look for guidance from a pro. Our cost estimator shows that the average price for mounting a flat screen TV is $298. This cost may fluctuate based on where the cables are located and how large your TV is. 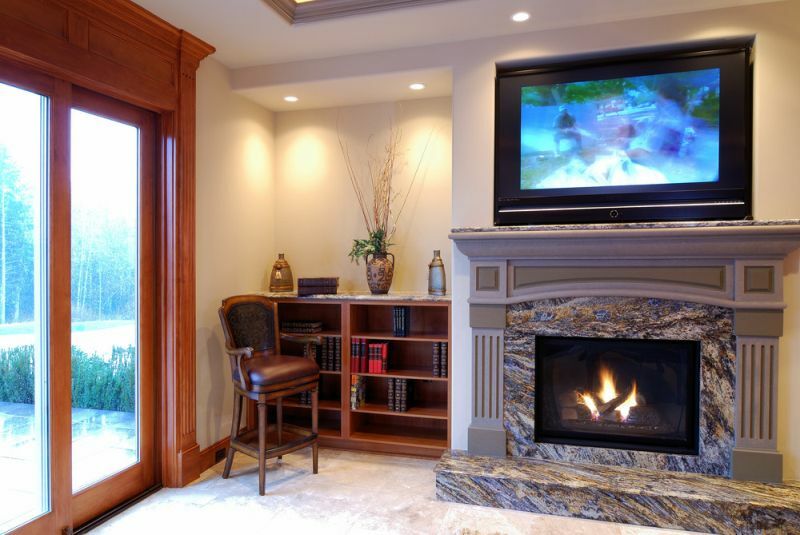 More space is one of the most obvious and important benefits that come with mounting a TV over the fireplace. If your TV isn’t hung over your fireplace, then there is a good chance you will have a TV stand, dresser, or entertainment center in the room. Although many TV stands continue to get thinner, they still can take up a lot of valuable space in your living room. 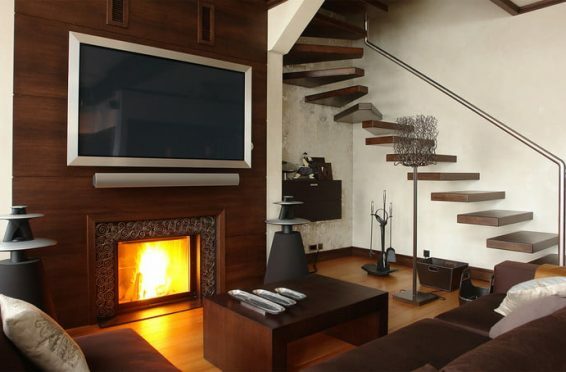 When a TV is mounted over the fireplace it helps to free up space in the area under the TV. So whether you are using that area to leave it blank to reduce the amount of clutter, store firewood, or install a fireplace, having extra space always allows you to use other designs. The most common reason for mounting a TV over your fireplace (or on the wall) is probably that it allows you to hide all of the ugly wires from view. Yes, you can stuff the TV wires behind you TV when placing it on a dresser or nightstand, but anyone walking by will still be able to see them. When a TV is mounted over the fireplace it allows you to put all of the ugly wires into the wall. Some professionals install wall plates while others push the wires through the wall. Either way, if your flat screen TV is install over your fireplace, be sure that the ugly wires are placed inside of the wall. Many people will not add a lot of design elements surrounding the fireplace and TV since both of them can of course serve as the room’s focal point. However, when the space below is not occupied it does provide you with more design flexibility when it comes to decorating the room. Often, if your TV is being installed onto a large wall, then the wall is going to need to have other elements in order to enhance the overall and feel of the room. When there is less “noise” underneath you have a lot more possibilities available to you. However, if you feel that your fireplace and TV are enough, you don’t need to add accompanying pieces just to simply add more. A TV at eye-level offers the ideal viewing experience. 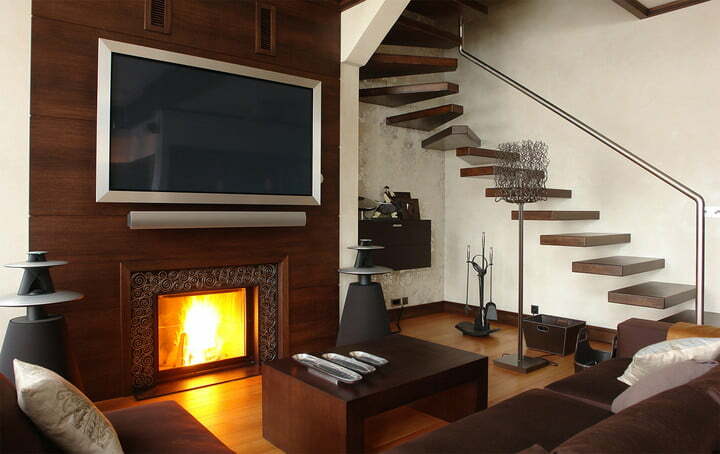 Chances are good that won’t be possible if you are going to mount your TV over the fireplace. The farther up the TV is, the larger the strain your neck will be under. Think of it as similar to sitting in one of the first rows in a movie theater. Nobody ever sits there because the view is so poor, and it also gives you neck strain that is felt later on. Sitting higher up is a lot more comfortable. Brad Simpson, who is the Clinical Director and a Physical Therapist at life’s Work Physical Therapy, states that looking at a raised screen for extended amounts of time may hinder neck function. He added that you can lose being able to use your neck for stabilizing. As we will be covering next, a TV that is mounted over a fireplace needs to have some separation due to it being close to heat. Maybe the most obvious reason for not installing a TV that close to your fireplace is due to its proximity to heat. Heat and electronics definitely don’t mix, and so that is why they tend to be put in separate places. A majority of TVs work the best when they are in settings that have lower temperatures. Many people claim that installing a TV over the fireplace will greatly reduce its lifespan, which over the long run can cost you more money. Also, even if you don’t plan to light your fireplace very often, smoke is something TVs don’t do well with. If you are going to mount your TV above the fireplace, be sure to clean it frequently. Otherwise, a hazy film might start to form on it due to the smoke which can ruin visibility very quickly. A majority of us end up spending as much as $500 to $1,000 on a quality TV due to its fabulous viewing experience and pristine picture. However, it you aren’t watching your TV from a good angle, then all of your money could end up going to waste. The farther away you are from the middle of the screen, the more picture quality changes. Viewing angles are even recommended by manufacturers and if those conditions are not met, then that $500 TV you bought might have a picture that is the equivalent of a $250 TV instead. Using a swivel mount is one thing you can do to help reduce this angle. A swivel mount enables you to point your TV down, which can greatly improve a mounted TV’s viewing angle. If you’re interested read this guidebook on wall fireplaces. Although the necessary steps will be somewhat different when you are going to mount a TV to a brick wall, overall the same general principles are going to apply. 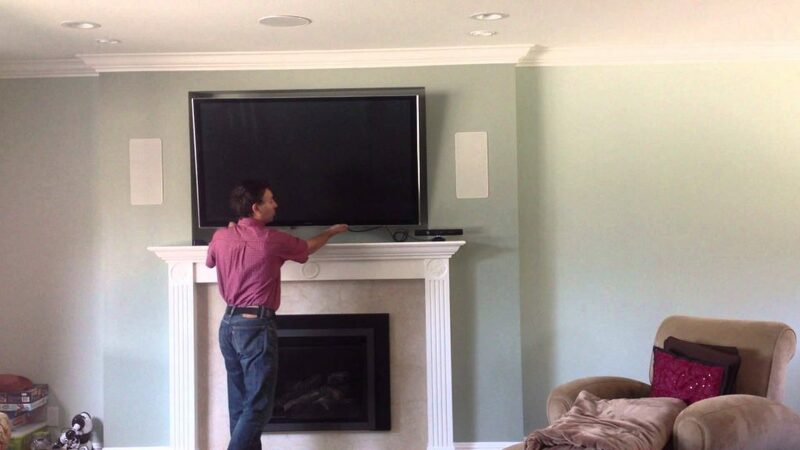 If you don’t want to pay to hire a professional, then see our DIY Tips For How To Mount a Flat Screen TV here. Mounting a TV above a fireplace has become very popular and a hot trend recently, which has resulted in becoming second nature for many homeowners. However, you should consider the above pros and cons, and do some research before you make a final decision.